As the world slowly cottons on to the idea that we start needing to live a bit more sustainably, a few things that used to be mainstays of a house are now coming back into vogue. People are turning back to vinyl, op shops are being raided and the veggie patch is becoming more and more common, even in inner city homes. A veggie patch isn’t just a trend you should pick up on; it’s a great idea for your home that carries a number of benefits. Health: Basically every Australian needs to eat more fruit and vegetables, and the fresher the better. The ones you pick up in the supermarket have probably been sitting in the back of a truck (or even a boat) and have lost a lot of their nutritional value. On top of that, they’ve also been covered in pesticides and fertiliser. You can’t beat the freshness and nutrients that you get from something that you’ve literally just pulled form the ground so you can expect to live a far healthier life with a veggie patch. Money: You’ll save a lot of money on your grocery bill once you have established your veggie garden. No more paying $8.00 a kilo for capsicum, you’ve got a fresh vine of them in your backyard and all you had to pay for where the seeds. What Will Your Family Gain? More Veggies: Your kids are likely to eat more veggies if they have the chance to pull them from their own backyard. It makes the process so much more fun! Broccoli and brussel sprouts have never been so exciting! More Time Together: Gardening is a great way to bring a family together; your kids will love getting their hands dirty in the veggie patch. They’ll also get a lot of satisfaction in watching that little seed turn into a huge pumpkin. Take it To School: After they’ve picked up the skills your kids can suggest they plant a veggie patch at school. Your child will have gained a new skill and they’ll be able to pass it on to other kids at school. Get Them Off The Couch: Our increasingly sedentary lifestyles are dangerous for our kids and for us. We need to create more opportunities to get outside and get moving and veggie patches are a great way to do this. Digging holes, spreading mulch and pushing wheelbarrows full of soil are all great forms of exercise and a great way for the entire family to get off the couch and get out in the great outdoors. What Will You Give Back? Save Land: Eating from a small veggie patch is a far more sustainable than eating from a large-scale factory farm. Firstly, the greater our need for crops, the more we have to destroy natural land to cultivate it. Secondly, pesticides and fertilisers cause harmful run off that poison our waterways. A veggie patch is a small, but useful, contribution to making a change in this area. Compost: Instead of throwing peels, eggshells and food scraps in the bin and adding to landfill you can compost all of these and use it to fertilise your garden. What If I Don’t Have Enough Space? A windowsill can become a veggie patch. As long as you’ve got sun, soil and water you can grow something. 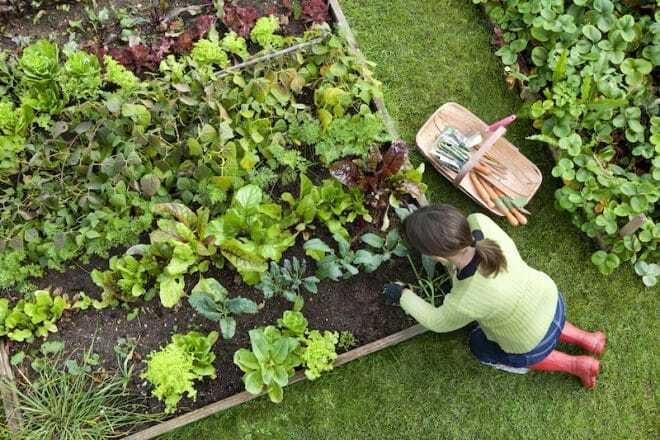 Modern landscapers are coming up with all sorts of ideas to turn small spaces into overflowing veggie patches. You can install a vegetable garden on your roof or you can grow tomato and grape vines up your wall. You can use old wooden pallets to create vertical herb gardens or even create layered vegetable gardens to make the most of your space. The truth is, if you want a vegetable garden you can have one. It doesn’t matter how tiny your space is. All you need is a good spirit, a willingness to get your hands dirty and an understanding that even a green thumb loses a crop every now and then. Our expert landscape team can help you out with any questions you may have about installing a vegetable garden. We can come and install it for you or we can supply you with all the materials you need to get the job done yourself. So don’t waste this weekend. Get outside, grab a pair of gloves and get to work on your own veggie patch. Do it for yourself, your family and most importantly for the world we all love.